Same day dispatch on most orders made before 1pm Mon-Fri, excluding UK Bank Holidays. 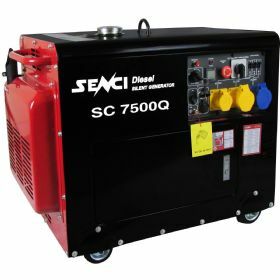 The Senci SC7500Q Generator has a tough and robust design casing that is sound proof with a cannopy to silence the noise level. Weighing 172kg when dry and with sturdy wheels making it portable and easy to move. This quiet generator for its size only boasting 70-74 Db(A)@ 7m and has a popular electric start system. It is ideal for builders, hire centres and mechanics. It's a low cost generator which can be used for small business and home use, boasting a max power of 5.50kw running up to 18 hours. Powered by easy-to-start electric start. New AVR Brush or self-excitation Brushless. Boasting a powerful 6.25KVA rated power output and a maximum power output of 6.80KVA. Circuit breaker cuts off electricity system when overloaded. Super strong original-designed fuel tank. Full closed control panel dustproof and water resistance. Perfect performance with stable running up to 18 hours for home or commercial use. ATS ready can be linked to house mains when purchased with an Automatic Transfer Switch (Not Included). 3 in 1 meter measures Volts, Frequency and Run time. Extra safety features such as seperate circuit breaker for each socket an an emergency stop button. *FREE Next Day Delivery is included as standard on most UK Mainland orders over £100. Orders under £100 - delivery is charged at £6.99. We aim to dispatch the same day on orders placed before 1pm Monday to Friday. Some restrictions apply. Orders placed after 1pm on a Friday will be sent out on the Monday when we are back in the office. Deliveries will take place on working days unless service is upgraded. Unfortunately we do NOT offer a local collection service. Please note we are closed on UK bank holidays. Please contact us for a delivery quote if you would like to upgrade your order to a Saturday service. Please note some remote UK locations are 48 hour minimum delivery, we cannot guarantee Next Day Delivery for these areas. Please be advised that locations such as the Scottish Highlands, may incur a delivery surcharge. Contact us prior to purchasing if you're unsure as to whether this will effect you. We offer worldwide delivery, please contact us prior to ordering to ensure we can deliver to your country and for pricing/estimated arrival times. Please note: Import duties, taxes, and charges are not included in the order price. These charges are the buyer's responsibility and not that of Machine Direct. ​​​​Please check with your country's customs office to determine any additional costs prior to purchasing. All goods are brand new unless otherwise stated. If an item arrives damaged or faulty then it must be returned to us within 30 days of receipt. Unfortunately, we cannot refund any items that have been damaged due to misuse, wear and tear or accidents. Please contact us with your order reference for more details. If you ordered an item incorrectly then you are welcome to return it for a refund or exchange. These must be returned to us in original condition and in the original packaging within 30 days of receipt. Please contact our support team with your order reference for more information. All our products are covered by a manufacturers guarantee of 1 year unless otherwise stated. This covers faulty materials/workmanship. It does not cover general wear and tear or damage. All product warranties are subject to the manufacturers terms and conditions. Machine Direct is only a retailer of good and services, all individual product warranty claims will be managed by the manufacturer. We will be happy to help you contact the appropriate company & assist as necessary. However we are not responsible for any product directly and the manufacturers decision is final. Please be aware the product warranties are only valid to customers based in the United Kingdom. If you have any questions please contact our support team.